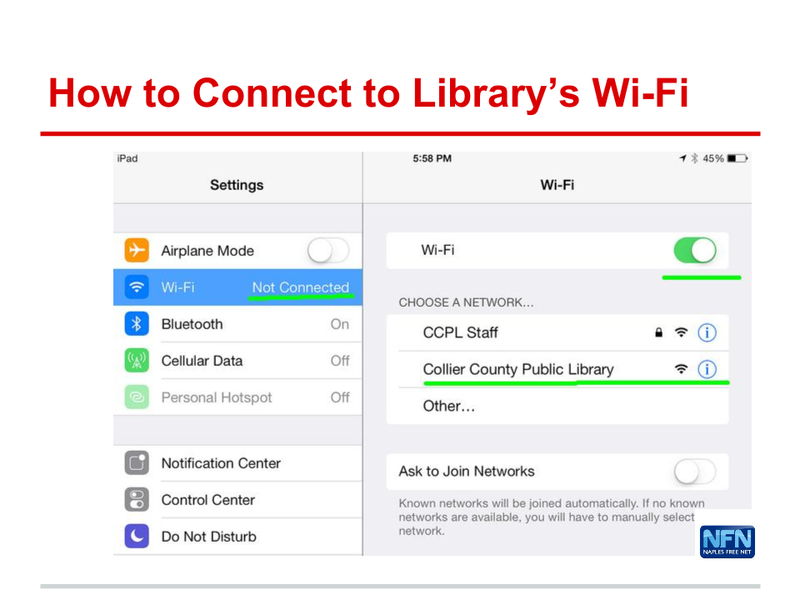 During our cooperation with the Collier County Public Library on Computer classes our Naples Free-Net instructors are often asked, how one connects to the Collier County Public Library’s Wi-Fi system, they provide in all branches. We will discuss this topic in the “Tablet, Smartphones and Apps” lecture this week, but not everyone who needs this information will be able to make it. No matter if you are NFN member or a Collier County resident or a visitor in our Paradise, this is for you! If you like what you read, we always appreciate a donation to the Naples Free-Net, your 501 (c) (3) nonprofit, all volunteer community network. 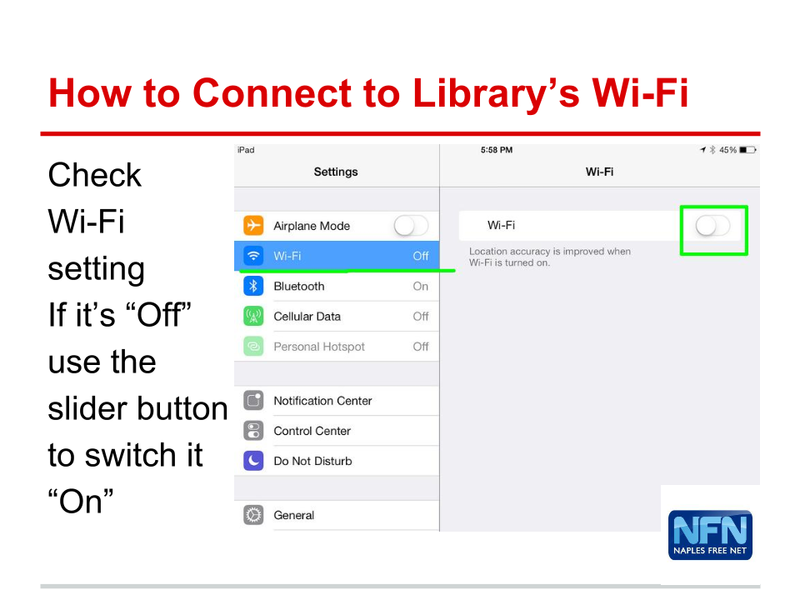 Check your Wi-Fi setting. If it’s “Off”, use the slider button to switch it “On”. 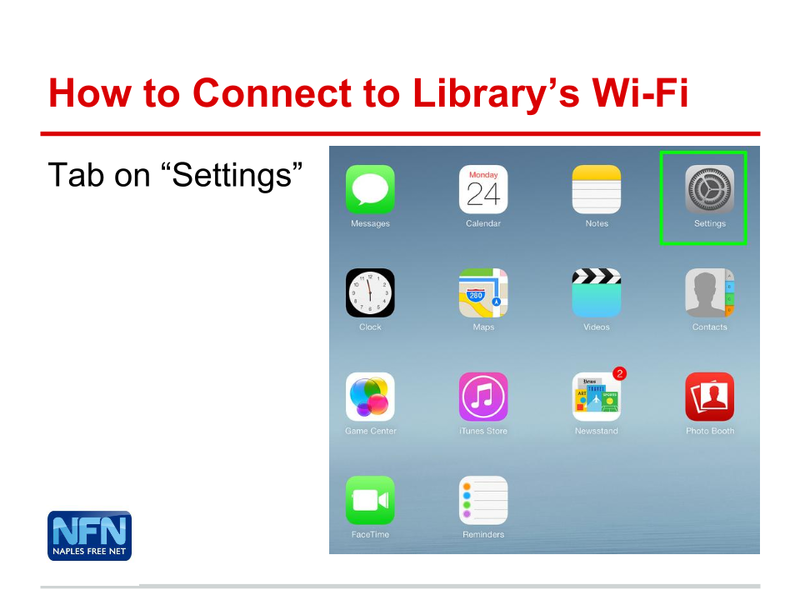 Ones the Wi-Fi is turned on it will scan the area for broadcasting signals of Wi-Fi networks, and you will see available networks in a list. 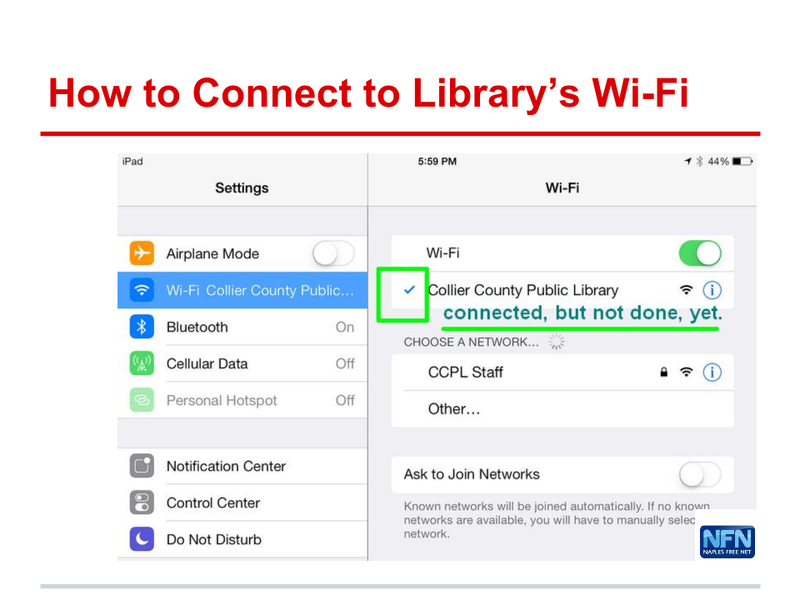 Those that have a lock next to their name are not public Wi-Fi networks and would need individual access information. 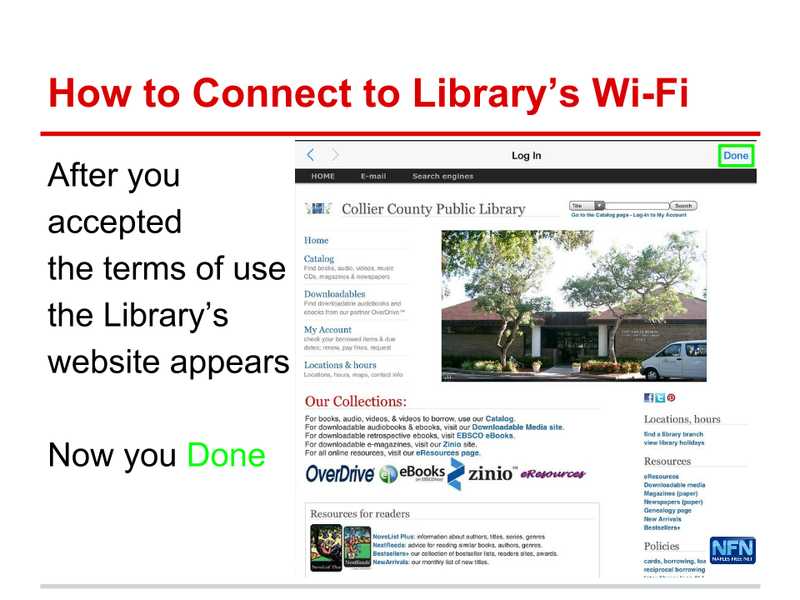 You see “Collier County Public Library in the list. ” Tab on the name to connect. 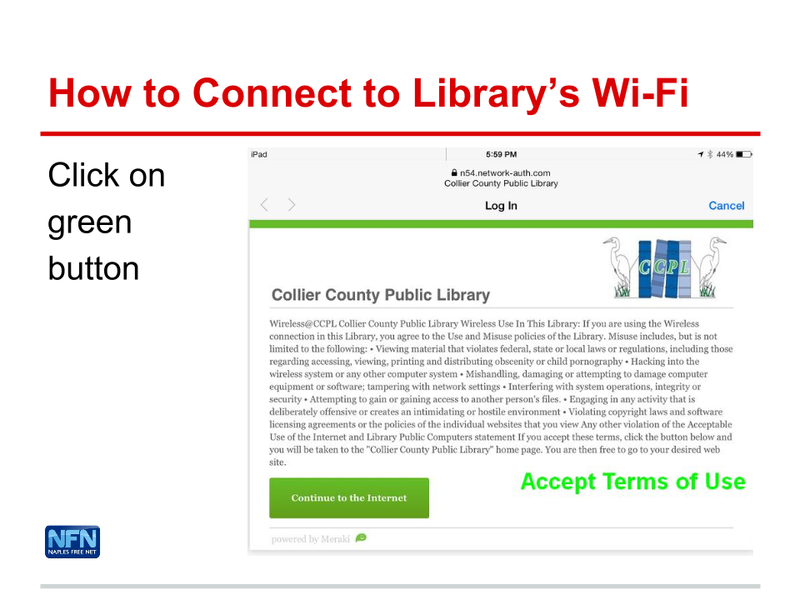 The next screen shows you the Collier County Public Library’s public website and you are done. Now you can open any of your APPs to go about reading the news, checking emails, visiting Facebook, or writing online. Feel free to post questions below in the comment section and we will be happy to answer them.